Tyndale House Publishers, Inc, 2000-12-07. Compact. Bonded Leather. Used:Good. Tyndale House Publishers, 2002-07. Leather Bound. Good. Tyndale House Publishers, 1997-07-15. Hardcover. Used:Good. Tyndale House Publishers, Inc, 2001-10-01. Bonded Leather. Used:Good. 1997-07-06. New. Ships with Tracking Number! INTERNATIONAL WORLDWIDE Shipping available. Buy with confidence, excellent customer service! Tyndale House Publishers, 2002-07-01. Hardcover. Used:Good. 1997-05-04. Good. Ships with Tracking Number! INTERNATIONAL WORLDWIDE Shipping available. May not contain Access Codes or Supplements. May be ex-library. Shipping & Handling by region. Buy with confidence, excellent customer service! 1996-01-07. Good. Ships with Tracking Number! INTERNATIONAL WORLDWIDE Shipping available. May not contain Access Codes or Supplements. May be ex-library. Shipping & Handling by region. Buy with confidence, excellent customer service! 1997-07-06. Good. Ships with Tracking Number! INTERNATIONAL WORLDWIDE Shipping available. May not contain Access Codes or Supplements. May be ex-library. Shipping & Handling by region. Buy with confidence, excellent customer service! Tyndale House Publishers, Inc.. Leather Bound. LIKE NEW. Like new, very light shelf wear. Tyndale House Publishers, Inc, 2005-07-05. 2nd. Imitation Leather. Used:Good. Tyndale House Pub. LEA. Religion & Spirituality. New. Brand New: This item is brand new unopened, never used and still in its original manufacturer condition. Tyndale House Publishers, 1997-07-15. Hardcover. Good. Tyndale House Publishers, Inc, 2000-10-01. Bonded Leather. Very Good. Bible is in very good condition. The presentation page has been filled out by the previous owner, but no other markings noted in text. NO BOX! Bookmark included and not frayed. No bent pages noted.We ship 6 days a week. Tyndale House Publishers, Inc, 2004-07-01. Hardcover. Good. Tyndale House Publishers, Inc, 2004-07-28. Hardcover. Used:Good. Tyndale House Publishers, Inc, 2006-02-27. Paperback. Good. Tyndale House Pub. Religion & Spirituality. New. Brand New: This item is brand new unopened, never used and still in its original manufacturer condition. Tyndale House Publishers, Inc, 2006-02-22. Gift. Paperback. Used:Good. 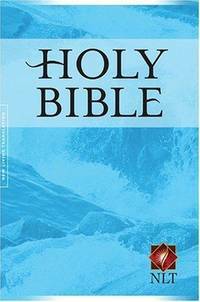 Tyndale House Publishers, Inc.. Paperback. GOOD. Spine creases, wear to binding and pages from reading. May contain limited notes, underlining or highlighting that does affect the text. Possible ex library copy, thatâll have the markings and stickers associated from the library. Accessories such as CD, codes, toys, may not be included. Tyndale House Publishers, Inc.. Bonded Leather. POOR. Noticeably used book. Heavy wear to cover. Pages contain marginal notes, underlining, and or highlighting. Possible ex library copy, with all the markings/stickers of that library. Accessories such as CD, codes, toys, and dust jackets may not be included. Tyndale House Publishers, 2006. Paperback. Acceptable. Disclaimer:A readable copy. All pages are intact, and the cover is intact. Pages can include considerable notes-in pen or highlighter-but the notes cannot obscure the text. An ex-library book and may have standard library stamps and/or stickers. At ThriftBooks, our motto is: Read More, Spend Less.Dust jacket quality is not guaranteed. Tyndale House Publishers, Inc.. Hardcover. POOR. Noticeably used book. Heavy wear to cover. Pages contain marginal notes, underlining, and or highlighting. Possible ex library copy, with all the markings/stickers of that library. Accessories such as CD, codes, toys, and dust jackets may not be included. Tyndale House Publishers. Paperback. GOOD. Spine creases, wear to binding and pages from reading. May contain limited notes, underlining or highlighting that does affect the text. Possible ex library copy, thatâll have the markings and stickers associated from the library. Accessories such as CD, codes, toys, may not be included. Tyndale House. Paperback. POOR. Noticeably used book. Heavy wear to cover. Pages contain marginal notes, underlining, and or highlighting. Possible ex library copy, with all the markings/stickers of that library. Accessories such as CD, codes, toys, and dust jackets may not be included.